Hello, and welcome to a little summer project I have decided to start! 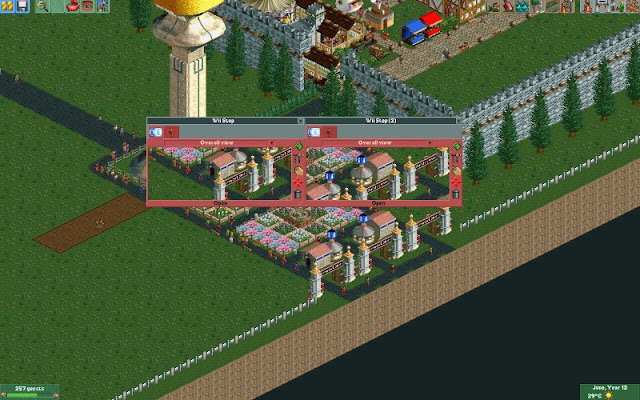 With the fairly recent news of the Nintendo/Universal Studios deal, whereby Universal Studios will build dedicated Nintendo rides in each of their theme parks, I thought that I would create a full-on Nintendo theme park myself, using the brilliant theme park sim, Roller Coaster Tycoon 2. What made me choose 2 over 3, I hear you ask? 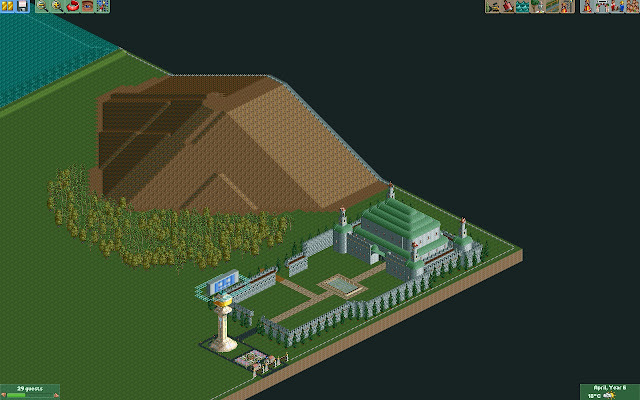 Well, mainly because I don't have RTC3, but also because RCT2 provides an even greater challenge with it's limitations, and I have a greater nostalgic value for this version. However, of course I cannot take on this great task alone, so I am enlisting YOU, Fellow SONMers, to also become coaster designers and park architects! 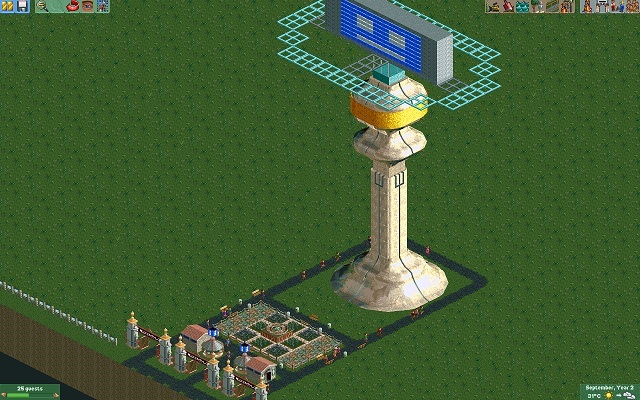 I already have a few coaster reservations for specific Nintendo franchises, but I really want you guys to participate and suggest ideas, and I will build them to your specification. And with that, Nintendo Land is already open! As you can see, there is a varied landscape. I have split it up into certain zones (Top left corner of the map was and will be particularly difficult to differentiate) which I will be sticking to throughout, where each Nintendo franchise will be located. *Gasp* What's this at the entrance to Nintendo Land?! Yes, already I spent about an hour and a half building Monita to greet the park visitors. Whereas this area with the rocky mountain here, is going to be Hyrule, with the mountain being Death Mountain, and we could have the Lost Woods in this area as well. And finally, one of the more confusing zones, and even more confusing as to how we are going to represent this, is the Varied Zone (not a great name, I know). The peak of the mountain here (covered in ice) I tried to make look more like cloud cover in contrast to the brown rock below it, so I was thinking we could have a Kid Icarus area on the peak, something to do with Ice Climbers at the base of the mountain, and then we can throw in any other franchises where we see fit. And there we have it! An overview of Nintendo Land and where things are (going to be) located. 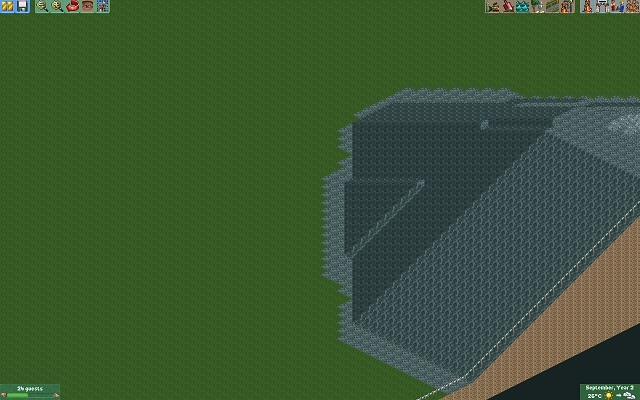 Now, it's all down to you to suggest ideas, rides and aesthetics assigned to each zone. 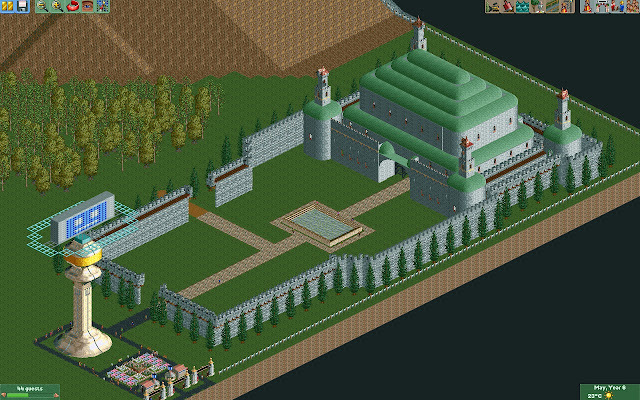 Bear in mind though, that we will be working from the entrance towards the back of the park, so ideas for the Mushroom Kingdom and Hyrule areas should be noted first. Last edited by SupaWaluigi on Mon Aug 31, 2015 3:30 pm, edited 23 times in total. You've got to make a Mario ride first, surely. Peach's Castle first, good choice OR. It'd be our version of the Disney castle. This is pretty cool, I'll have to keep following it. Oh and I know it's not really Nintendo, but there's some Sonic themed custom scenery here that I thought was pretty cool that you might be interested in. I'll keep an eye out for actual Nintendo stuff in the future. Should make a Zelda attraction, like a walk-through dungeon maze or something. As long as it doesn't draw inspiration from Link's Awakening then it'll be fine. 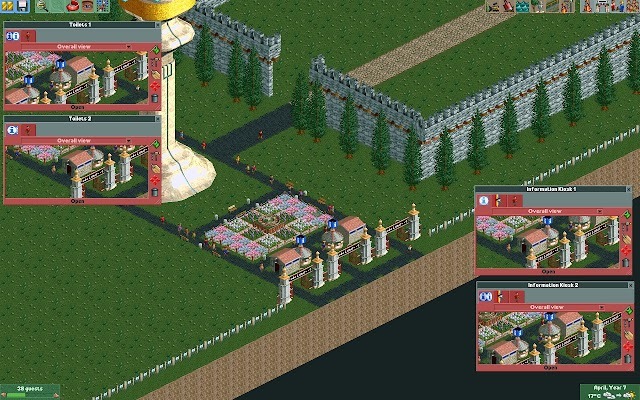 Jezo wrote: Should make a Zelda attraction, like a walk-through dungeon maze or something. As long as it doesn't draw inspiration from Link's Awakening then it'll be fine. 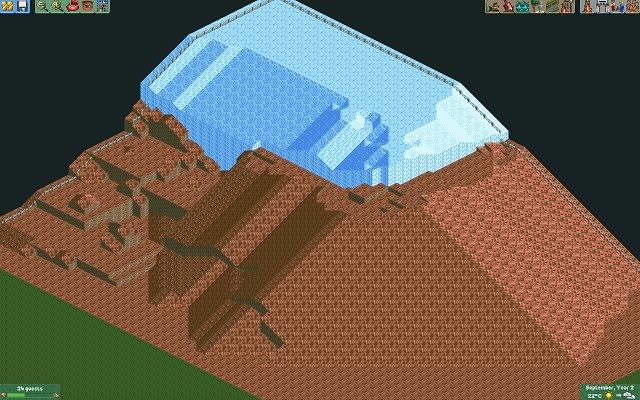 Each piece of track can only be one solid colour afaik, so it'd have to be in sequence. I know some of you wanted to see Peach's Castle first, but in order to judge the placement and size of her castle, I decided to see how large the adjacent Hyrule area would be. So here we are! After a whole morning's work, Hyrule has begun to take shape! 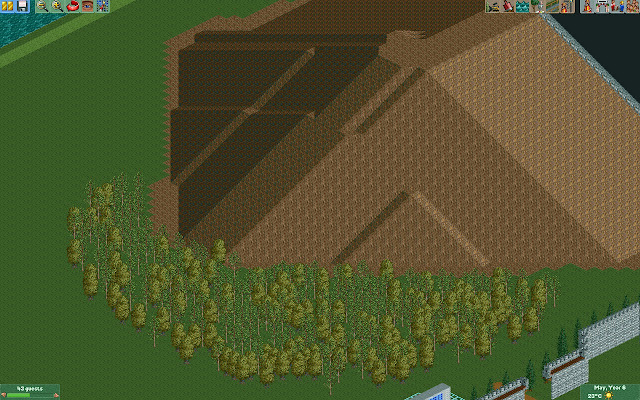 I also decided to change the colour of Death Mountain to a darker brown ground texture so that it looks a little bit closer to it's representation in the games, although I will change it back if you would prefer. After realising that I can't place multiple trees down at once and much clicking, the Lost Woods has also grown and transformed more of the area. I'm not too sure about how it looks myself at the moment, but I will neaten it up, maybe add some different trees, and hopefully it will look a bit better. 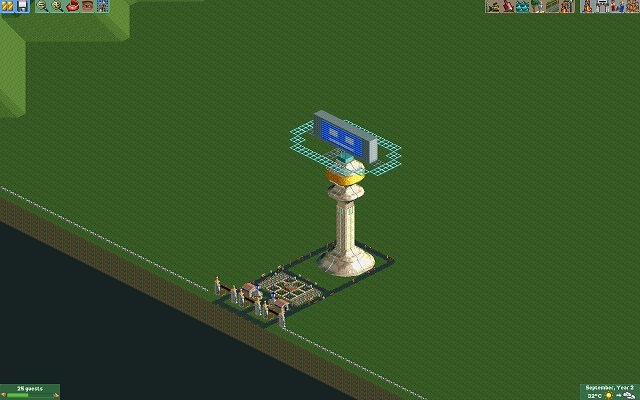 One thing I forgot to mention in the first couple of posts is that I want you to name the rides, shops and stalls. Last edited by SupaWaluigi on Mon Jul 27, 2015 5:26 pm, edited 1 time in total. danbish wrote: Oh wow, well done! 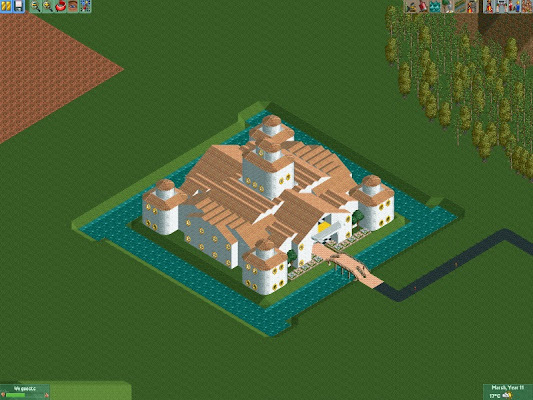 Now, I though building Hyrule Castle was a slog. Building this was much more frustrating and slow, despite being shallower in height (I think). 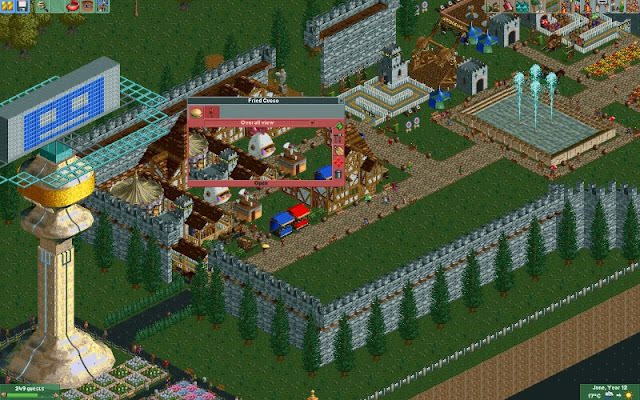 Mainly because the isometric camera angle makes building roofs turn into optical illusions and incredibly difficult to get the right position for each scenery object to be placed! But hey, I think the end result is pretty good. 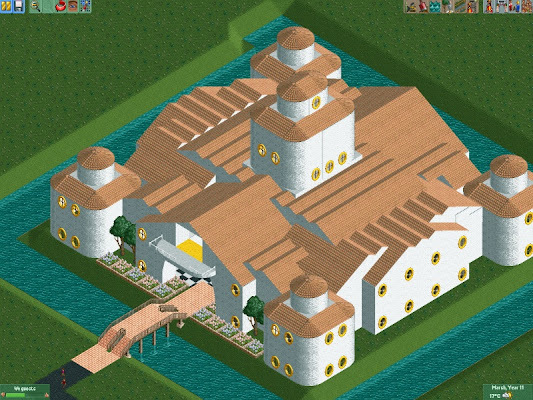 There aren't any roof pieces that are pointed enough (I have been using an image of the castle to replicate) and so it looks a bit squat and slightly different. I know the roof isn't as red/pink as in the games, but I quite liked the tile effect, and the only other roof piece that would have been good to use was the same one as for Hyrule Castle. 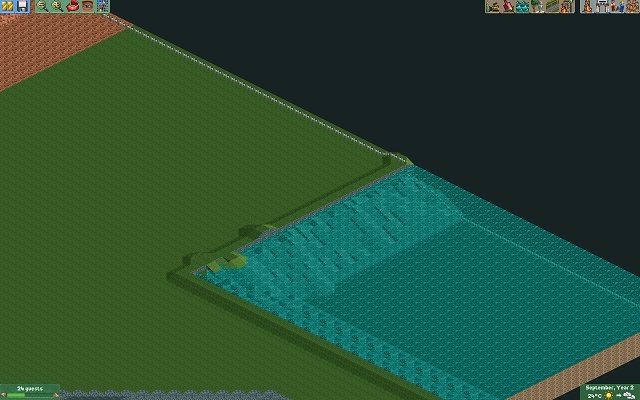 Minor improvements can also be made as the park grows. Holy cow! That's amazing! Very well done sir. 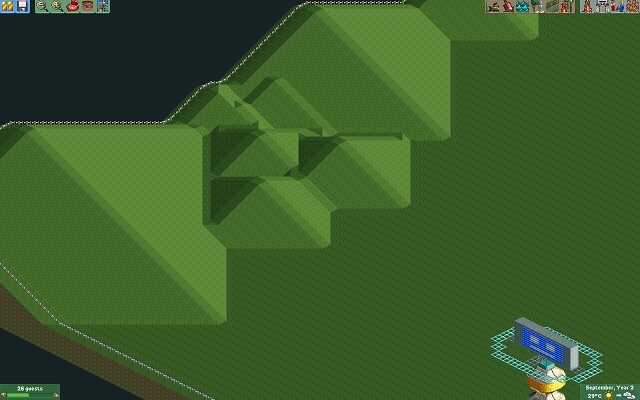 I never had the patience for building these kind of buildings in RCT2 with the isometric view, so this stuff is looking pretty good. This is awesome, and also now featured on the home page! Oh wow, I am honoured that this is a home page feature! 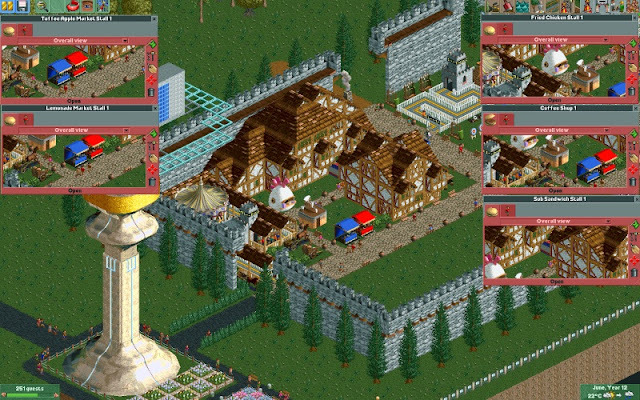 So, Castle Town has now started to take shape, adding in a couple of medieval-like town houses (of which more will be built), and accompanying scenery such as animatronic horses, carts, wooden benches and barrel bins. 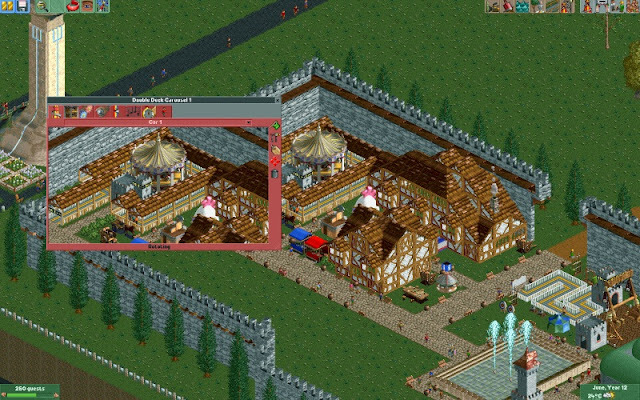 The Double Deck Carousel was the first ride added, it's fairground music blaring (louder than usual, seemingly) away, attracting guests into the Hyrule area of the park. And it needs naming!! Amidst the town houses, the first food and drink stalls have also been constructed. 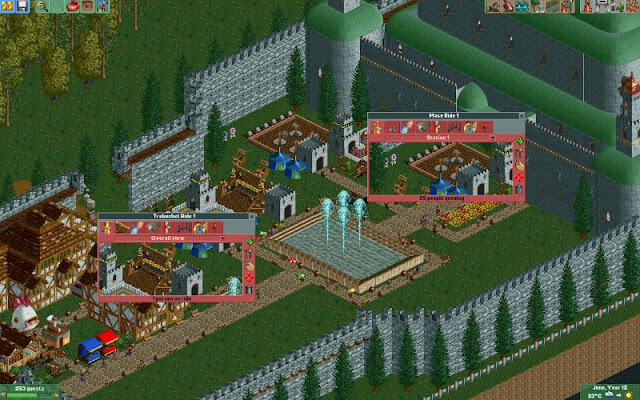 Now choice is very limited, especially when the only two medieval styled shops are the Toffee Apple Market Stall (Red) and Lemonade Market Stall (Blue). However accompanying these shops are the Fried Chicken Stall, Coffee shop and Sub-sandwich shop, and these all need naming too! 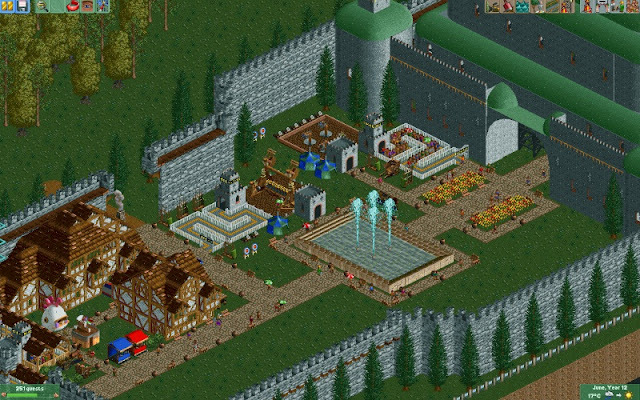 Moving on towards Hyrule Castle, I have decided to make this section of Castle Town into a sort of armoury. 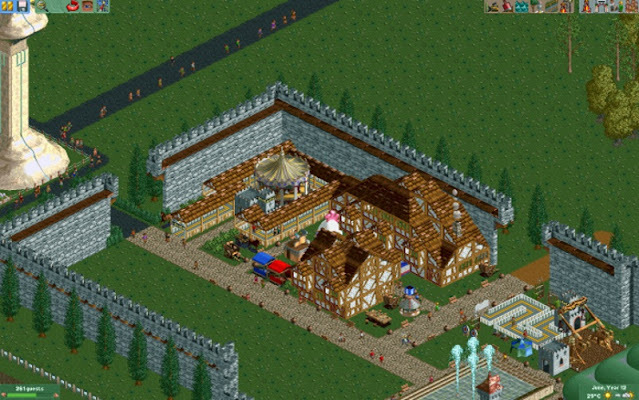 Rides built here include the Trebuchet Ride (A medieval themed Top Spin) and the Mace Ride. Both make guest incredibly sick, meaning Castle Town will soon become inundated with pools of nasty stuff (You know what I mean..). Names for these too please! And all Information Kiosks in Hyrule will now be named after Legend of Zelda assistants, such as "Navi". 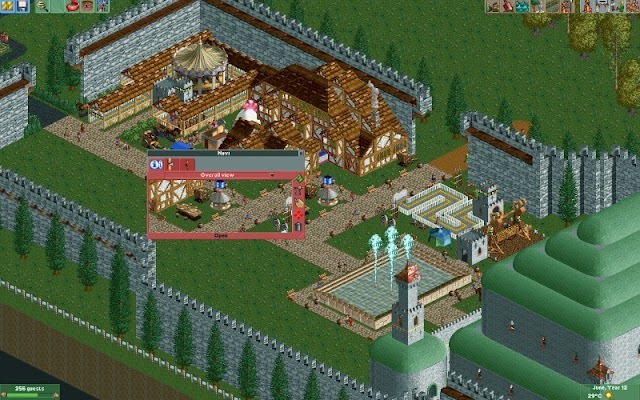 Re: Nintendo Land - Roller Coaster Tycoon 2 Project *Update! I dub thee carousel "Galloping Eponas"
Now, I'm not that knowledgeable on all things Zelda, but I recall there being a pub in a game or two... I think. That coffee shop could take the name of one of them. And the Toffee Apple stand should be Syrup's Potion Shop. There absolutely must be a Donkey Kong Minecart ride somewhere .. also a Metroid Blast or F Zero spaceship ride or something along those lines.